Rent villas and country houses in Canillas de Albaida, Spain with private pools. This exquisite holiday home for 9 people is situated on terraced land nestled on the mountainside and offers guests a lot of space. This lovely villa is situated in Canillas de Albaida and impresses with its stunning views of the mountains and the sea. All of the bedrooms are equipped with a private bathroom and a balcony. This impressive villa is situated in Canillas de Albaida and boasts stunning views of the mountains and the sea. All of the bedrooms are equipped with a ensuite bathroom and balcony. Diese schöne Ferienvilla liegt in Canillas de Albaida, einer Gemeinde in der wunderschönen Provinz von Málaga, die von der Sonnenroute, Weinroute und der Route der weißen Dörfer durchzogen wird. 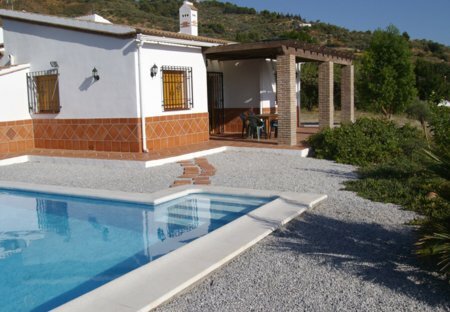 This beautiful holiday home is beautifully situated in Canillas de Albaida in the province of Málaga. The tastefully decorated 2-bedroom house has a large patio area with communal pool. This bright and modern holiday home is surrounded by olive groves in the mountains of the Nature Park "Tejeda, Almijara y Alhama". This fantastic holiday home is situated in Axarquía, Málaga, close to the towns of Cómpeta, Torrox, Nerja and Frigiliana.